In order to get started all you have to do is register your song information and add the audio of the song to your Connect account. Once that’s done our music synchronisation team will listen and process the audio, this then is added to our playlists and online music platforms which sync clients looking to license music can access. What are music supervisors looking for when listening to a song? Mainly it all comes down to what the client is looking for, but it’s important to remember that supervisors might be contacting 30 or so other labels & publishers like Connect to get hold of music; so it’s our job to make our artists stand out against the competition. Often supervisors give us multiple reference tracks which might be a direct replacement dictated by price such as “We want Black Skinhead by Kanye West, but can’t afford it; do you have something similar”. Or it can be a creative reference such as “We really like the vibe of Lonely Boy by Black Keys, do you have something in a similar style”. They also need to know background information on the artists we pitch. If they’re paying money to license a piece of music they want to know why they should pay for your track rather than another. So it’s never a case us sending music to clients, it’s always with key points on them such as radio coverage, good press, big gigs or tours coming up and generally anything to make them stand out against the tides of other artists. Should I always have an instrumental version of all my tracks? Why is it important? Instrumentals are essential! The reason is due to around 70% of syncs being licensed are for instrumental versions of songs. This is mainly due to adverts/TV having lots of voice overs, so having the instrumentals available can often be key in making a deal happen. How do I apply for sync opportunities via CONNECT Songs? What audio format should I be using (mp3, wav, wma)? As previously mentioned the Connect sync team actively pitch out tracks on behalf of our artists directly to the client. However we also allows artists on the Connect programme to view and apply for a selection of briefs we’re working on via the Sync Briefs section. From here you can put forward your music which clients can then access via a playlist and listen in their own time. Therefore allowing artists the opportunity to directly view what clients are looking to license and submit direct. In the world of sync Mp3’s are preferred, so if artists could upload an Mp3 of the original and instrumental version to their account that would be perfect. It’s also worth noting that in order for artists to access the sync briefs section of the site then they must have at least 5 tracks for submission to the clients. How long does it take to find out if my song landed a placement? It’s dependent on the deal. If it’s a deal with an upfront fee then it usually means that we have to contact the artist direct to get clearance on the master side, so as soon as the client show interest in the track we get in touch. A lot of work we do is also done in Europe, which changes the way in which music is licensed. For TV placements the majority are done via ‘blanket licenses’ which means music doesn’t generate an upfront fee, instead it generates royalties every time an episode airs which can all add up to a decent amount of income. Connect collect this income directly with all the European collection societies then pay through to artists. The only issue with the blanket licenses is that TV clients don’t have to inform rights holders when music is used, so we sometimes only find out about placements once the royalties are paid through. What happens once your song is selected? Who reaches out to me? Once a song is selected and confirmed a member of the Connect sync team will reach to the artist and update them with the placement information and what to expect in terms of payment schedule and air dates. How do I know how much money I’ll get paid and when can I expect my earnings? If it’s a traditional upfront deal then the artist will know the amount to be paid to them before a deal is signed off. The time a traditional deal takes to be paid through is a case by case basis, it’s simply down to some clients accounting faster than others. With blanket licensed deals as mentioned above it usually takes around 9 to 12 months for royalties to be paid through to Connect, once they have been we distribute to the artist. When there’s income to be paid we email a statement to the main account holder who can respond with payment details. Payments are made quarterly (January, April, July & October) and it’s up to the account holder to split up any income with co-writers or other band members accordingly. If any writers are direct members of a collection society and have added the details of their CAE/IPI number to CONNECT Songs, their writer share of royalties will be paid directly by their collection society. Who decides how much money my song is worth? Is it negotiable? It can be hard to put a value on someone’s creative work and art, but we’re very firmly in corner of someone wanting to exploit and use a piece of music then they should pay a fair price for doing so. A lot of it comes down to the brand involved, territory, media, exclusivity and length of agreement. If it was a large brand wanting a 2 year exclusive license worldwide for a song on all media (TV/online/cinema/radio) then that would demand a much higher price than someone just looking to license a track for a small online promo. A lot of this also comes down to us working within synchronisation for the last decade and being able to judge a bad deal from a good one. What is a synchronisation fee? A synchronisation fee is what clients pay in order to clear publishing and master copyrights. The publishing side is represented by Connect for artists on the service. The master side is controlled by whoever paid for the recording of a track to take place, traditionally a record label but more often the artist themselves in the modern music industry. How competitive is it to land a sync? What advice can you give so I make sure my songs are being heard by the right people? There is no denying that synchronisation is incredibly competitive. With record sales in decline and other areas of the music industry shrinking, people are now turning to synchronisation as an alternative source of income. The knock on effect means there is often a lot of people chasing the same deal. Clients looking to license music simply couldn’t deal with artists directly to find music as they would be inundated. 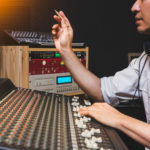 Instead they work with record labels and publishers like Connect to help them narrow down their search, effectively using the sync team here at Connect as a filter to help them find that perfect track. In reality we never know what the clients will be looking for when they come to us, which means there is no ‘top of the pile’. One search might be for Dubstep and another might be for Folk music so the team has to be aware of all the music on board. The thing that does help the team when pitching is artists having their accounts up to date with the latest news and bio, plus making sure all the latest tracks and audio have been submitted. The more audio we have to work with then the more clients we can get the music in front of. Learn more about Sentric Music here.